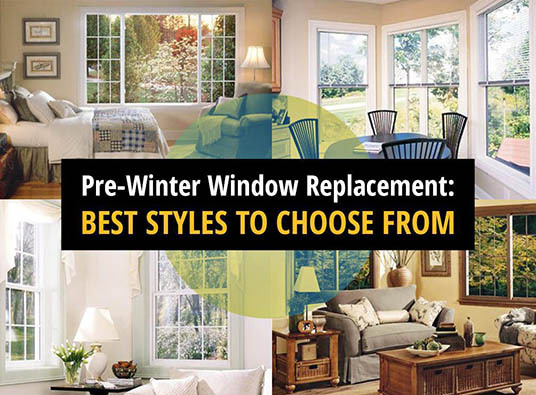 Replacing your leaky, old windows is a smart way to prepare your home for the cold winter months. You don’t just get improved energy efficiency from new windows but elevated security, beauty and weather resistance as well. Pick the right units on a room-by-room basis to achieve your pre-winter home improvement goals. Also called sash windows, double-hung units comprise two staggered sashes that glide past one another vertically. Kroll Construction recommends them for historic renovations because they’re emblematic of traditional homes, like Cape Cods. Modern products have sashes that tilt in, which make cleaning a snap. Another quintessential element of centuries-old architectural styles, the casement is the most energy-efficient of all operating windows. Hinged on one side, it swings outward completely to allow maximum ventilation. When closed, its sash presses tightly against the frame to minimize air infiltration. Casements remain sought-after because they’re excellent for egress. These replacement windows consist of multiple glass panels that jut out from the exterior wall. They provide a natural niche that expands the interior floor space, providing opportunities for extra seating and storage. The main difference between the bay and the bow is that the former is angular, while the latter is curvy. Either of them can capture panoramas and admit a profusion of daylight. Sliding windows are the best for short walls because their width is greater than their height. They also have two staggered sashes that move past each other horizontally. The primary purpose of these fixed replacement windows is to frame scenic view, which is why they’re usually large. Their expansive glass area lets in a generous amount of sun useful for passive solar heating. They don’t provide ventilation opportunities, so install them in rooms with other means of regulating airflow. Garden windows also project outward, providing an instant ledge to display anything. They usually feature a fixed middle panel, operating side flankers, and a glass roof, making them perfect for nurturing plants inside your home. Let Kroll Construction help you outfit each of your rooms with the best window style to meet your unique functional and aesthetic needs. Call us at (844) 688-9632 to schedule your FREE, in-home consultation in Detroit, Michigan, at your convenience.